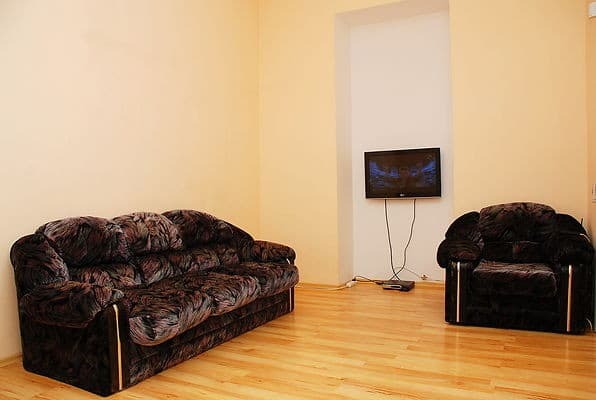 Cozy studio apartment is located in the Podol district, a 5-minute walk from the subway station “Kontraktova ploscha”. The apartments are located next to the river station, promenade, restaurants, cafes, shops and supermarkets. Each apartment has a large room with a double bed, desk and TV. Fitted kitchen is equipped with all necessary appliances and equipment. All bedding are included. Apartments are equipped with appliances, cable TV and free Wi-Fi. You can get the full package of accounting documents. Apartment keys can be picked up directly at the apartment or at the concierge desk near the apartment at the agreed time. Distance from the Railway Station is 6.7 km, from the airport “Borispol” - 38.2 km. Description of the room: One - room economy - class apartment is located next to the Samson shopping complex, the river station and the embankment. Spacious apartments with high ceilings in the Royal House. There is a living room with a convertible sofa, 2 armchairs, a coffee table. Cozy studio apartment is located in the Podol district, a 5-minute walk from the subway station “Kontraktova ploscha”. Distance from the Railway Station is 6.7 km, from the airport “Borispol” - 38.2 km. Get on the metro to the station Kontraktova Square. Further from the station on foot to the address about 5 minutes.